The Daily Front Row once again hosted a luxurious lounge called "The Daily Style Sessions” during Mercedes-Benz Fashion Week. The lounge was located at the ritzy Empire Hotel rooftop where picturesque views of the city provided the perfect background. Guests were offered lots of fabulous treats like complimentary makeovers and manicures. You could even charge your phone while you were perusing all of the great sponsors. The lounge was a perfect retreat from my hectic schedule of shows at the tents. 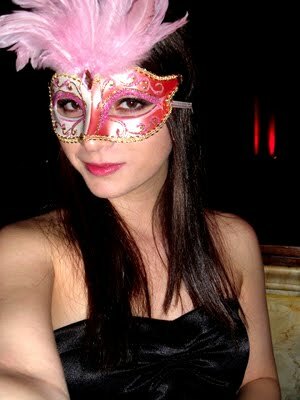 I had the best time relaxing, mingling and of course taking lots of pictures along the way! My first stop at the lounge was the Downy Infusions table. I was asked to pose holding one of their latest scents. The Downy rep is showing me what the photo looked like in this picture. Next, I ran into Andrew Werner, an incredibly talented photographer. 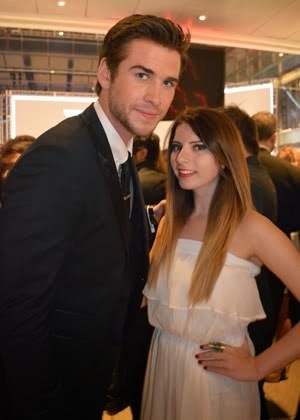 I was lucky to meet him a few seasons ago at Mercedes-Benz Fashion Week. We chatted for a bit while he was waiting to take a photo of Nicole Richie. After catching up I had the honor of having my photo taken by Andrew. Check out his website to see his fabulous work: andrewwernerphotography.com. Before I ventured off to see more of the lounge my friend snapped this candid photo of me touching up my lip gloss. The beautiful jeweled ring on my finger was courtesy of Kensie if you were curious! 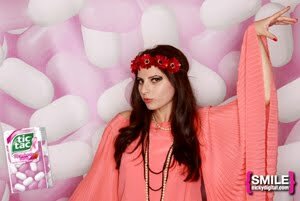 Next, I stopped by That Maddona Girl to try on their lovely flower headpieces. Here is a photo of me wearing the Kimmie flower piece. I was completely in love with all of their hair accessories. Complimentary Belvedere cocktails were available to guests. 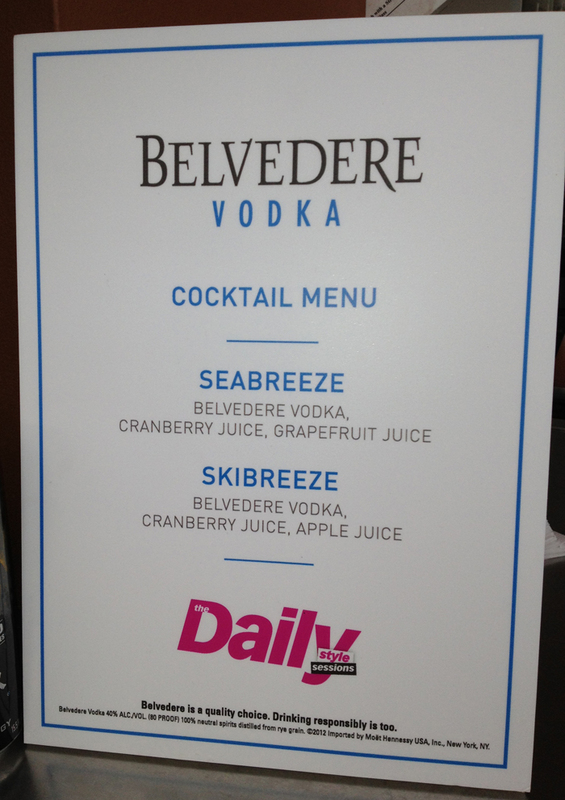 I chose the Skibreeze which had a combination of Belvedere vodka, cranberry and apple juice. I stopped by the vbeauté table where I learned about their skincare line that was started by socialite and entrepreneur Julie Macklowe. Clos du Bois Winery and Pixi Beauty had a table about their makeup collection which was inspired by Rouge, Clos du Bois' newly launched red wine blend. One of my favorite sponsors was Alex and Ani which is a unique jewelry line that offers eco-friendly, positive energy products. They gave me one of their beautiful bracelets which I'll blog about in a later post! Brightbox provided a secure box to store and charge your phone. They place these box's in bars, restaurants, movie theaters, gyms, and everywhere else people spend time out. You simply swipe your credit card to open the bright box and then close it shut. After you're done you swipe it again to re-open it. This is such a brilliant idea that I'm surprised no one else thought of it before! I would definitely use one if my phone was in need of charging in a safe place. Did I mention what a warm and beautiful September day it was? I took a little break outside to appreciate the lovely views of the city that surrounded the Empire Hotel rooftop. While outside I ran into Kelly Osborne who was posing for a few pictures before she made her glamorous exit. Other celebrities also in attendance included Nicole Richie, Paris Hilton, Nicky Hilton, Kristin Chenoweth, Shenae Grimes, Kevin and Danielle Jonas, and Lauren Conrad. The Daily Style Sessions was truly the crème de la crème of lounges during Mercedes-Benz Fashion Week this season. Thank you so much to the Daily Front Row for inviting me!